Posted in Empower Sales Conversations, Increase B2B Sales, Sales, Why LeveragePoint? What would you say if I told you that only 19% of sales meetings that B2B executives take actually live up to their expectations? Would you be surprised? Would you believe that 67% of the time sales reps are giving lengthy PowerPoint presentations about your products, and NOT about the customer’s business? Are you doing anything about it? 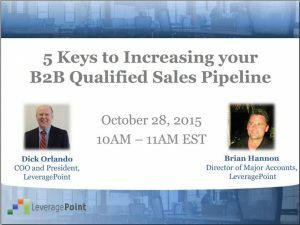 Watch and you will see 5 keys to increase your revenue by adding more qualified sales opportunities to your pipeline. Richard Orlando is President and CMO of LeveragePoint. 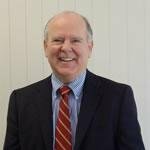 Previously, he served as EVP, Sales & Marketing at Biscom, Inc. He has held multiple senior leadership positions at companies, such as Saztec International/Datamatics Ltd., CMGI, Data General and Wang Laboratories. His primary areas of expertise are in sales & marketing, operations, and Web 2.0 implementations to drive new business. Mr. Orlando holds a BA in Business Management from Northeastern University.